36 / Ricky made it home for Cable repairman. We had an appointment & they called & said they could come earlier. I told them come on because I didnt want them there so late anyways but always hate when I'm home alone with repairmen. I just always feel like I'm going to tell them the wrong thing. Ricky got home just minutes before the repairman pulled in. Whew. I was able to take Harvey Dent with me in the basement & get on the treadmill & run it out - no worries about the cable. Let the hubs take care of it. 37 / Etsy sales still happening. I am so happy that I'm still getting some sales in my Etsy store. I'm on the hunt for some ideas to knit/crochet for summer. I am thinking about making some bags like you can take to a farmer's market or to the beach. I've made some before. 39 / Harvey being my biggest workout cheerleader. I love when I work out, he sticks right with me. He gets on the couch when I'm doing videos & waits for me to get on the floor to do ab work or stretches & he runs over & has to lay right on top of me. & if I'm on the treadmill, he comes & lays down right next to it until I get off. Both Sydney & Buffy did the same thing. I'm so glad he does it too. 40 / Healthy Groceries. I complained Monday about the price of my last grocery bill but I really am glad I have the option to buy these healthier food items. I know a lot of groceries dont even have a 'health food' section & have as many options as our store has. I am truly grateful for that. 43 / Long run done. I SOOOOOooooooOOOOOO did not want to run on Saturday. But I had to have a pep talk with myself - followed by a pity party for one - & then laced up & got it done anyways. I was so glad I did it. Even more thankful when it was over & I could curl back up on the couch after a warm shower. 44 / Sweet card from MSM partner. I have a High School girl that helps lead in our small group -or I should say I help her. She's amazing. I always say that she is truly a Disney Princess. Honestly - she is. Her personality, her beauty, HER HAIR... it all screams Disney Princess. But bless her heart - she came in Sunday with a card for me for my birthday since she missed it over Christmas break. Just her words on the envelope & inside touched my heart so much. She blesses my socks off just knowing her. 45 / ALL THE BAPTISMS!!!!! Again, talked about this on Monday - but what an honor & privilege to see so many say they want to follow Jesus. 48 / Making a bad situation fun. 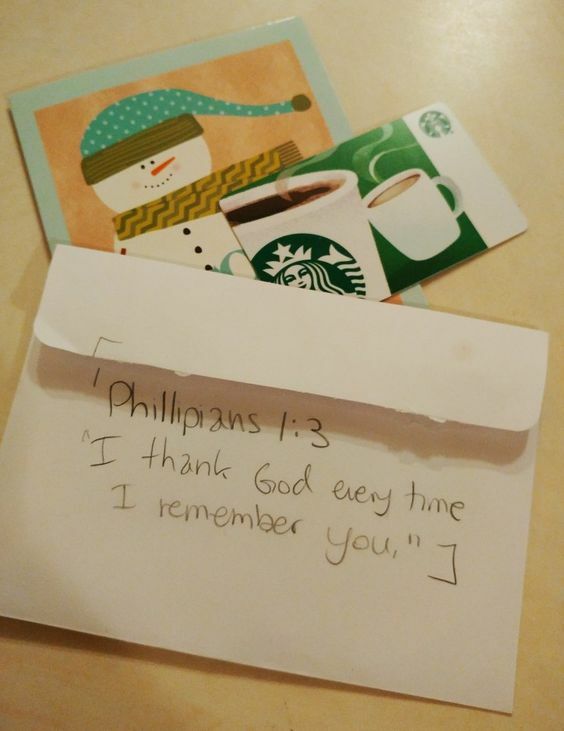 Ricky locked his keys in his car Tuesday on his way home from work when he stopped to hunt for the final boxes of Starbucks Holiday Blend coffee (a whole other story... we've been on the hunt non stop!) So he called AAA & they said it was going to be well over an hour to get there so I said I'd drive down his key. & then made it fun by bringing Bruno along - who poor guy was fearful he was going to the vet but perked up immediately after we drove by it. & do you know Ricky called me literally 3 minutes before I got to him & told me AAA had come & opened it. Are you freaking kidding me?!?!!?..... but we took that aggravation & turned it around because we took Bruno into the pet store by himself & got him a new collar & some treats & let him sniff to his heart's content in there. It made me happy to give him some one on one time. 49 / Our Starbucks Holiday Hoarding. We have found 6 boxes to stock up on. They all expire by May so we have enough now to get us to that point. Ricky is now trying to find another K-cup he likes as much so when these run out. 50 / Amazon deal on Protein Powder. I love this protein powder. Vegan / Gluten Free / no Dairy - just good clean protein powder with not a lot of 'junk'. I usually get it from the health food store closest to me but knew I needed some & knew I wouldnt be by the store so hello Amazon who can get it to me in 2 days. It was $7.00 more than I usually pay but I was OK with that for the convenience of it all. & then opened up the box & was AMAZED!!!! It was DOUBLE the size of the container I usually get. SO WORTH the $7.00 extra. That was such a fun surprise & I've since gone back to add to my wish list on Amazon to make sure this is my go-to stuff. What good things are happening in your life this week? I'd love to see the bags you are making. I'm a bag hoarder myself. I've decided that I can not have any more!!! Yay Bruno having one on one time! I'm thankful for our nice weather this week. I'm wearing my boots with the fur today with my dress (cus my feet hurt too much to put on my dress boots) and I actually had the thought that perhaps to fur boots are too much for this warm day....lol. But heck, it's still January so I can get away with it! the absolute best part of a run is when it's over and you can curl up on the couch again haha. i feel you there. I love how positive you are and how no matter what, you can find good in anything. I want to be you when I grow up. Ooooh. I love it when I order something and it comes in BETTER than what I thought I was getting! Enzo always shivers when we put him in the car- half from nerves and half from excitement. Usually he settles (and then gets excited again) when he realizes we're not going to the vet, ha! 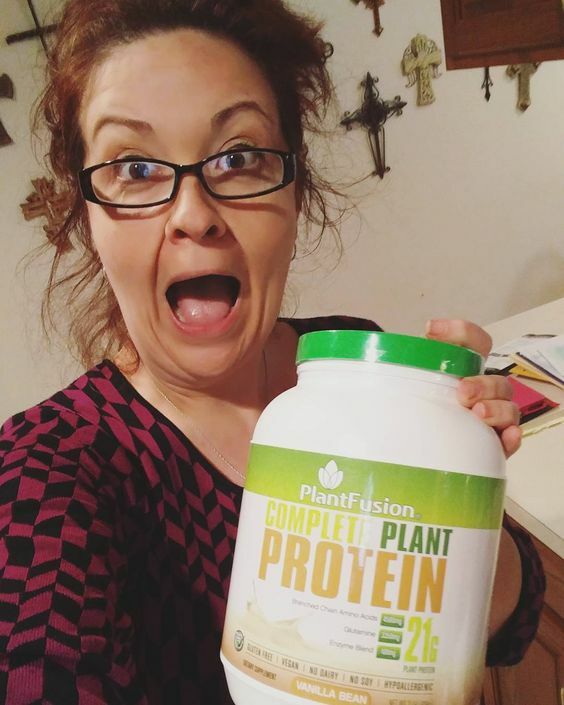 I love that picture of you with you giant size protein powder! So many blessings to count!! Life is good. What?! That's such a good deal from Amazon...to the win again, lol. Love that Harvey sticks close by when you exercise and Bruno perking up after you drove past the vet is awesome, especially since he was treated solo after. How sweet :) So many things to be thankful for! What a great thankful list. God is so good in big and little ways. not wanting to workout and then just doing it...i was there on tuesday..i was SO tired and really didn't feel like exercising but then just stopped the internal whining, changed, laced up my gloves and just did it -- and i was so glad i did! i felt a lot better afterwards. What is it about animals and vets? :D Granted, I don't do a happy dance when I need to see the doctor either. Yay for one-on-one time with Bruno! I bet he loved going to the pet store. That's a great verse from the bible. And I'm going to put that protein powder on my wish list. How gritty is it? That is my biggest pet peeves with so many protein powders. It's always good news when people are baptized and come to know Jesus as their Savior! Just think how many young girls' lives you are influencing! Awesome! Those long runs are so rough, but always worth it for the feeling AFTER! Especially when the couch is the next move! Aw...love that Harvey is your workout buddy. My Daisy likes to sit on me when I use the Total Gym. And Bruno? He's so cuuuuute...like one of those Valentine's stuffed animals. Love his shaggy little mug. I found one box of Starbucks peppermint latte at the food store this weekend and grabbed it right up! It is so delicious! I haven't seen it at any other store (and I've looked!!) so I'm only having one every few days to make it last as long as possible!! That's unfortunate timing about the keys, but at least Harvey had a fun shopping trip! !